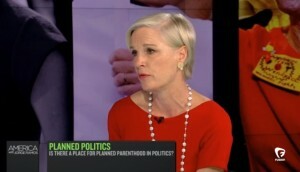 In a recent interview with Fusion TV, Planned Parenthood President Cecile Richards stated that she believes her children’s lives began at the time of delivery. Richards was being interviewed on the broadcast America with Jorge Ramos, who posed a question regarding Richards’ personal views on when life begins. “This is a question that I think will be debated through the centuries and people come down on very different points of view on that,” Richards replied. “But for you, what’s that point?” Ramos again inquired. Richards, in dodging the question, began to struggle with how to articulate her answer. Ramos, noting that his question had not been answered, then asked Richards why she would not state when she believes that life begins. “Why would it be so controversial for you to say when you think life starts?” he inquired. As previously reported, a recent report from the Planned Parenthood Federation of America outlined that the organization performed 327,166 abortions during the 2012-2013 fiscal year. Planned Parenthood cited that there were 2,197 adoption referrals during the period, equating to 149 abortions for every one referral.